Concept: Get a jump start on the holiday season with a quiz sweepstakes. Objectives: Highlight retail partnership with Whole Foods; acquire new emails via an interactive sweepstakes format. No matter how far ahead marketers start planning, the holiday marketing blitz can still feel like it crept up out of nowhere. In past years, Cyber Monday held the title as the digital shopping day of the holiday season, however, in 2018, projections are showing that shoppers will be buying early. Retailers and brands will need to be ready to seamlessly transition from back-to-school and fall fashion into the holiday shopping sprint ahead of December. To get a jump start on the holiday shopping season, Applegate launched a timely seasonally themed quiz sweepstakes, with equally seasonal rewards that consumers could win. To enter, all consumers have to do is answer a series of holiday themed questions, mixed with select product-focused fan faves questions showcasing Applegate's meat and deli products. Fans will have until November 11, 2018 to enter for the chance to win a two–day trip to NYC for one winner and three guests! Check out their quiz sweepstakes HERE. 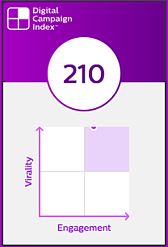 Applegate’s Quiz Sweepstakes’ DCI score is a combination of an Engagement Score (ES) of 121 and Virality Score (VS) of 299. Embed on your website. Applegate embedded their quiz on their main website, which not only kept consumers on the site, but also encouraged them to learn more about the brand and products they offer. Brands that embed a campaign on a larger website often see increased engagement through additional clicks and time spent on site. Beat the holiday rush. The competition for attracting your audience’s attention is stiff, offering an unbeatable prize like Applegate did, while also launching ahead of the cluttered holiday season is a great way to give your brand a leg up on the competition and increase engagement with your digital campaign. Enable multiple options for sharing. Applegate made a great choice by enabling their campaign participants the ability to share their quiz results in one of multiple ways, including Twitter, Facebook and via email, facilitating the share process and driving earned reach. Allowing one entry per day. Many campaigns limit consumers to only one entry throughout the duration of the campaign, but the Applegate team realized that allowing one entry per consumer, per day, would not only drive repeat traffic, but also repeat content and campaign-level sharing. Mobile and online shopping are going to have their biggest year yet this holiday season and marketers that are prepared to offer omnichannel experiences that span in-store, online and mobile will find success. 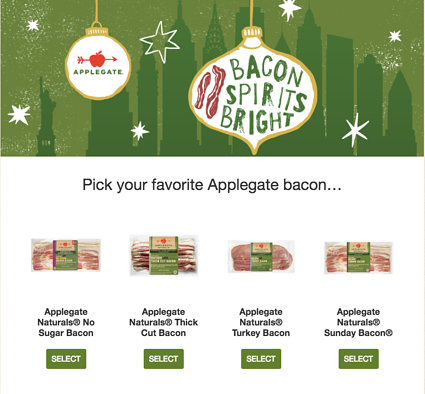 Applegate made smart decisions by launching their holiday campaign early, as well as bridging their online sweepstakes with in-store prizes and offerings.